In the Main Gallery, G.L.U.E. (Girls League of Urban Epistemology) will create an environment in the Main Gallery that aims to evoke viewers' thoughts and feelings about having/not having a home as one's place of respite. This site-specific installation is a visual meditation on the qualities that make us feel at home, and on how we create home. The installation is the work of eight artists, with each piece a personal response to their theme. G.L.U.E. has been meeting, sharing work, and exhibiting together for twenty years. 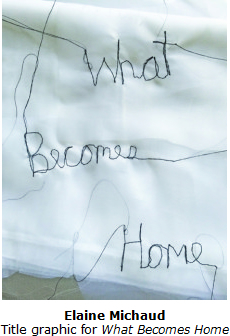 What Becomes Home is co-curated by Janet Arline Barker and G.L.U.E. G.L.U.E. consists of eight well-known Bay Area artists. They include Leigh Barbier, a painter and sculptor known for creating mythic and magical characters. Bodil Fox is a fiber artist and musician whose piece Re-creating Home is a meditation on the immigrant experience. Sculptor Sheila Ghidini's Family Tree is made from vellum, graphite, and thread. Regina Gilligan's piece is a story quilt offering comfort to those without homes, while textile artist Joyce Ertel Hulbert shares her Prayer Banners to End Homelessness. Mixed-media sculptor Elizabeth Medrano offers a textile work titled Traces of Threads and Scars. Elaine Michaud's Abide is an invitation in textiles and thread to acknowledge the deep meaning of home, and Laurie Polster incorporates old family recipes in her piece Stained Recipes. On Sunday, August 13, at 3:30 pm, G.L.U.E. 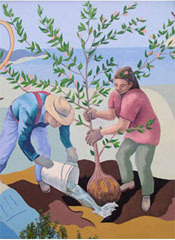 artists will give a free talk about their work.